By nearly every measure, 2016 was a sad year in the world of sports. We lost the great Muhammad Ali. Arnold Palmer. Gordie Howe. Pat Summitt. Will Smith. Joe McKnight. Blackie Sherrod. Craig Sager. Jose Fernandez. Monte Irvin. Bud Collins. Joe Garagiola. The list seemed to go on and on. Even this column, my annual whimsical attempt to predict the upcoming sports year, felt the sorrow of losing a dear friend, when sports columnist Peter Finney, a legend in his native New Orleans, passed away in August at the age of 88. It was Finney whose annual New Year’s Day newspaper predictions entertained readers in New Orleans for more than 40 years, and it was Finney who gave me his blessing to borrow the idea. I haven’t written that many yet, but for the 35th year in a row — and in Peter’s memory — here is my plebeian attempt at prognosticating the year ahead in sports. As always, no wagering, please. Dak Prescott starts, but Tony Romo quarterbacks the second and third quarters in the Cowboys’ 27-17 loss in Philadelphia. Owner Jerry Jones praises Romo for his “Tom Brady-like” sharpness, saying, “I can truly see Tony quarterbacking in this league for another four or five Super Bowls.” … Wisconsin outlasts Western Michigan 35-34 in wild Cotton Bowl. … Southern Cal defeats Penn State in Rose Bowl, Oklahoma pounds Auburn in Sugar. … Alabama repeats as College Football Playoff champion, wearing down Clemson 30-17 in Tampa. Seattle beats Detroit and Green Bay knocks off Giants in NFC wild-card playoffs. Steelers, Chiefs win AFC games . … Rangers sign free agent Mike Napoli to one-year, $10-million contract. … Pudge Rodriguez, Jeff Bagwell, Tim Raines and Edgar Martinez elected to Baseball Hall of Fame. Barry Bonds, Roger Clemens, Vladimir Guerrero and Trevor Hoffman barely miss required 75 percent of votes. Ezekiel Elliott dives for winning touchdown as Cowboys defeat Green Bay in overtime. In other divisional round games, Seahawks beat Falcons, Steelers win in Oakland and Patriots defeat Chiefs. … Free agent pitcher Tyson Ross signs one-year, $10 million contract with Rangers. Cowboys earn first Super Bowl berth in 21 years, rolling over Seattle 31-14. Patriots win AFC title over Steelers. … President Trump issues executive order, increasing college playoff to 16 teams beginning in 2018. “It’s going to be huge and it’s going to be great,” the president assures. Jerry Jones, LaDainian Tomlinson, Kurt Warner elected to Pro Football Hall of Fame. … Cowboys’ Dak Prescott misses team curfew during Super Bowl week, prompting midnight call by Owner Jones to Tony Romo to “get ready.” Investigation reveals that Prescott was at hospital, visiting cancer patients . … In Super Bowl LI, fourth-quarter touchdown catch by Jason Witten seals 31-27 victory over Patriots. 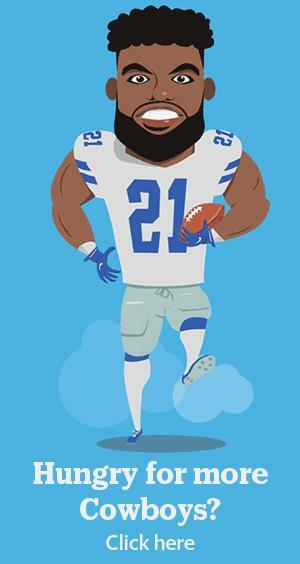 Elliott runs for 156 yards, named game’s MVP. In wardrobe mishap during halftime show, Lady Gaga accidentally loses thigh and two ribs from her famous meat costume. … Kevin Harvick wins Daytona 500. … NFL Commissioner Roger Goodell bans entire Cam Newton hat wardrobe. UT Arlington wins Sun Belt title, earns second-ever berth in NCAA tournament . … Kansas repeats as Big 12 tourney champion, defeating Baylor in title game. … TCU receives NIT bid. … WFAA’s Dale Hansen celebrates 65th year in television. … Josh Hamilton announces retirement from baseball. … Joey Gallo homers twice for Team Italy in World Baseball Classic loss to Mexico. Dominican Republic wins Classic, defeating Japan in finals. … Tony Romo traded to Denver Broncos for a No. 7 draft pick in 2017 and a pick to-be-determined in 2018. … Kentucky, UCLA, Duke and Kansas advance to NCAA men’s Final Four. … Horned Frogs reach NIT finals in Madison Square Garden, but fall to Michigan in title game . … UConn, Notre Dame, South Carolina and Baylor make women’s Final Four field in Dallas. … Gallo sent to Triple A Round Rock to begin season. Rangers end spring training with starting pitching rotation of Yu Darvish, Cole Hamels, Martin Perez, Andrew Cashner and Tyson Ross . … Playing in front of partisan home state crowd in Dallas, Baylor women stun favored UConn to win NCAA women’s basketball crown . … Duke stops Kentucky for men’s Final Four title . … Rangers open season with Jurickson Profar at first base, Mike Napoli as DH. “I like our team,” general manager Jon Daniels says. Matt Kenseth wins NASCAR O’Reilly Auto Parts 500 at Texas Motor Speedway. … Mavericks end season with 31-51 record, sixth-worst in NBA . … Stars eliminated by Minnesota Wild, four games to one, in first round of NHL playoffs . … Jordan Spieth atones for 2016 Augusta collapse, wins second Masters golf crown. … Cleveland Browns select Texas A&M’s Myles Garrett with first pick in NFL Draft. With 32nd pick, Cowboys select defensive end Taco Charlton of Michigan. Owner Jones swaps two picks to move up in second round and selects QB John Stephen Jones of Highland Park High School. At AT&T Stadium in Arlington, Highland Park’s 31-24 win in the 5A Division I semifinals over Denton Ryan was a family affair, in more ways than one. John Stephen Jones, the grandson of Cowboys’ owner Jerry Jones and the son of Cowboys’ COO/EVP Stephen Jones, helped lead the Scots to the state title game, which will be played next week in the same friendly confines. Video by Matthew Martinez. Mastery wins 143rd running of the Kentucky Derby . … TCU, ranked No. 1 in country, repeats as Big 12 baseball champion. … Henrik Norlander of Sweden captures Byron Nelson golf tournament . … Jordan Spieth repeats as Colonial’s Dean & Deluca Invitational champ. … Juan Pablo Montoya wins Indy 500. … Joey Gallo, batting .329 at Round Rock with 14 homers, called up by Rangers. … At groundbreaking ceremony, Rangers owner Ray Davis reveals new ballpark will have indoor shooting range in case anyone wants to let off any midgame steam. The mayor and supporters celebrate as Arlington as voters approve a new stadium for the Texas Rangers. Kevin Durant leads Golden State over Cleveland to win NBA Finals rematch. … Spieth wins U.S. Open at Erin Hills, Wis. … Montreal Canadiens win Stanley Cup. … TCU defeats Nebraska in NCAA Super Regional to advance to College World Series for fourth year in a row. …Despite only having an 8.8 percent chance of winning NBA Draft Lottery, Lakers get first overall pick, select hometown kid Lonzo Ball of UCLA . With No. 6 pick, Mavericks take 6-foot-11 forward Isaiah Hartenstein of Germany. … Sporting a fitting new title sponsor, Rainguard Water Sealers, TMS IndyCar race won by Scott Dixon. … Frogs finally scale NCAA baseball mountain, defeat South Carolina for first College World Series championship. Major League All-Star break finds Rangers in second place behind Houston in AL West. … Jonathan Lucroy, Shin-Soo Choo, Adrian Beltre and Yu Darvish named to AL team. … Novak Djokovic, Serena Williams capture singles titles at Wimbledon. … Record summer crowd watches Cowboys open training camp in Oxnard, Calif. … Astana team at Tour de France under investigation for use of self-driving Google bicycles. … In effort to boost subscribers, Longhorn Network announces 72-hour marathon of 2006 Rose Bowl. Jerry Jones’ induction speech at Pro Football Hall of Fame runs a little long — 45 minutes — necessitating ESPN schedule shuffle. … Steelers defeat Cowboys in Hall of Fame exhibition opener. … Tony Romo injures left shoulder in Denver preseason opener . … Serena Williams regains U.S. Open tennis singles title. Men’s crown goes to Japan’s Kei Nishikori. … President Trump names Roger Staubach as Secretary of Navy. Texas A&M falls in season opener at UCLA. … Texas defeats Maryland in opening game for coach Tom Herman. Longhorns make it two in a row before losing at Southern Cal. … Aggies knock off SEC foes Arkansas and South Carolina to end month 4-1. …TCU offense struggles and Frogs lose at Arkansas and Oklahoma State to go 2-2. … Defending Lombardi champion Cowboys open with victories over Packers and Falcons, but Broncos — with new quarterback Romo — knock off Dallas in Denver. … Paris named host city for 2024 Olympics. Los Angeles finishes second in voting. Rangers claim third consecutive AL West crown. … Royals defeat Mariners in AL wild-card game, but lose to Red Sox in divisional round. Indians eliminate Rangers in five games. Boston beats Cleveland for AL title. … Dodgers turn tables on Cubs and win NL pennant. Dodgers win World Series for first time since 1988. … Longhorns, behind QB Shane Buechele, defeat Kansas State and Baylor, but lose back-to-back close games to Oklahoma and Oklahoma State. … Tough month also claims Aggies, who lose at home to Alabama and on road at Florida. … Horned Frogs fall to West Virginia, but raise record to 5-3 with wins over Kansas State, Kansas and Iowa State. … Cowboys beat 49ers and Redskins, then fall on road to Giants. … Best-selling author Jim Reeves releases new book, a revealing biography of former Cowboys coach Chan Gailey. In 45-40 shootout, TCU defeats Texas for fourth year in a row. … Longhorns defeat Kansas and Texas Tech, lose at West Virginia to finish 7-5 in Herman’s first season. … Aggies lose to Auburn and LSU to finish 7-5. Kevin Sumlin terminated as A&M head coach. … Frogs lose at Oklahoma and Texas Tech but close with win over Baylor to finish 7-5. … Cowboys open month with impressive victories at Philadelphia and at home against Seattle, lose on road at Arizona, but beat Kansas City in Thanksgiving game to raise record to 8-3. … Kyle Larson wins NASCAR AAA Texas 500 at TMS. … Dak Prescott misses Arizona game after injuring foot while delivering Thanksgiving turkeys to needy families. In Big 12 championship game in Arlington, Sooners avenge regular-season defeat to Oklahoma State 41-35. … CFP semifinal pairings will match Southern Cal and Ohio State in Rose Bowl, Alabama and Florida State in Sugar. TCU and Auburn will play in Texas Bowl, Texas and A&M will meet in Liberty Bowl, and Texas Tech headed for Cactus Bowl . … Cotton Bowl will pit LSU against Oklahoma. Oklahoma quarterback Baker Mayfield wins Heisman Trophy. … Cowboys fall at Oakland to open month, but finish strongly with wins over Rams, at Redskins, Giants and Eagles for 12-4 record and again earn top seed in NFC playoffs. … Texas A&M names Virginia Tech’s Justin Fuente as its new head coach. … Russians hack Rangers’ annual Hall of Fame voting, leaving Milton Bradley and Vicente Padilla as next season’s inductees.